"What is a charism? A charism is a gift of grace not for one’s personal sanctification but for the benefit of others. St. Paul has a list of charisms in the twelfth chapter of First Corinthians, including the gifts of prophecy, speech, miracle-working, and the interpretation of tongues. 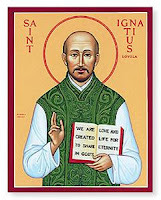 What if any are charisms given to St. Ignatius of Loyola?" Read more about the charisms of Ignatius as seen through the eyes of Avery Cardinal Dulles, SJ by clicking on the image of Ignatius.